Placing concrete in hot weather poses one of the greatest challenges in construction. This is because concrete gains the majority of its properties during the temperature-dependent cement hydration reaction. 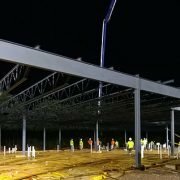 Temperature of the concrete, surrounding air temperatures, and form temperatures can all play a substantial role in the quality of the final concrete product. Large volumes of concrete are placed during the hottest months of the year, therefore managing and mitigating threats associated with placing concrete in hot weather is crucial in today’s fast-tracked construction industry. Hot weather is defined as job-site conditions that accelerate the rate of moisture loss or rate of cement hydration of freshly mixed concrete, including an ambient temperature of 80F or higher, and an evaporation rate that exceeds 1kg/m2/h or as revised by the Architect/Engineer . Understanding the threats that hot weather poses and how to mitigate those threats in an efficient and effective manner can determine the success of a project. 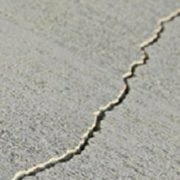 Plastic shrinkage cracking – cracks that occur due to rapid evaporation of bleed water. Planning during hot weather concrete placements is recommended in ACI 305 “Hot Weather Concreting”. Planning can consist of preplacement conferences, use of admixture and evaporation products, adjusting concrete mix proportions, and others. All of these should be focused on reducing and controlling temperatures and evaporation rates. Wind, relative humidity, ambient temperature, and concrete temperature are the largest factors when considering evaporation rate. The nomograph below has been used throughout the industry for decades and still prevails as the most widely used tool for calculating evaporation rates [Fig. 2]. There are many different ways to mitigate risks that come with hot weather concreting. A combination of measures taken at the ready-mix plant and the jobsite can allow for concrete to be placed at high temperatures. Acceptable production methods to reduce the temperature of concrete at include: shading aggregate stockpiles, sprinkling water on coarse aggregate stockpiles; using chilled water for concrete production; substituting chipped or shaved iced for portions of the mixing water; and cooling concrete materials with liquid nitrogen . Acceptable jobsite measures include timely placement and finishing, control of bleed-water evaporation, curing, and protection. These jobsite measures are all focused on reducing evaporation rates when conditions are threatening. Methods to reduce evaporation rates on site include erecting wind shades and sun shades, using evaporation retarders, using proper curing methods, and others. be stored at temperatures between 60 and 80 degrees F for normal strength concrete, and between 68 and 78 degrees F for concrete with a specified compressive strength of 6000 psi and higher. Additionally, the specimens should be shielded from direct sunlight and protected from moisture loss . Another consideration is thermal shrinkage of the concrete structure due to rapid drops in concrete temperature of 22C (40F) in the first twenty-four hours. Thermal shrinkage can be reduced by using chilled concrete, using cool pipes in the concrete structure, using supplemental cementitious materials (SCM), using mist water, shading the slab, or using curing methods . [Fig 1] CIP 12 – Hot Weather Concreting. 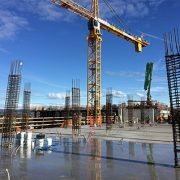 Concrete in Practice – What, Why, How?Retrieved December 18, 2018, (2000) from https://www.nrmca.org/aboutconcrete/cips/12p.pdf.